Just months after controversial parliamentary and presidential elections in Russia, the country’s two top leaders, President Vladimir Putin and Prime Minister Dmitri Medvedev, enjoy solidly favorable ratings among the Russian public. Democratic stirrings among the public notwithstanding, the survey finds that favorable views of Putin are influenced first and foremost by economic factors: people who say the economy is good or feel they are better off than their parents are more likely to have a positive opinion of Putin. To the degree that democratic values factor into attitudes toward Putin, those who say an uncensored media is important are less likely to have a positive view of the third-term president. Other figures on Russia’s political stage barely hold a candle to Putin. Russians generally have negative views of Putin’s challengers from the March 2012 presidential election, especially the outspoken nationalist politician Vladimir Zhirinovsky. Alexei Navalny, a critic of Putin and one of the lead organizers of demonstrations protesting recent elections, is unknown to more than half of the Russian public. 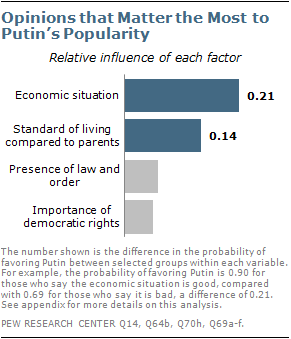 Vladimir Putin is well liked by most Russians, with roughly seven-in-ten (72%) offering a favorable opinion of the recently re-elected president. 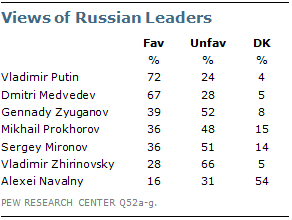 Only about a quarter (24%) of respondents have an unfavorable view of the Russian leader. Putin is broadly popular, but especially so among women, those ages 30-49 and those with less than secondary education (75%, 75% and 77% favorable, respectively). Overall, assessments of the national economy and social mobility play the greatest role in shaping attitudes toward Putin. Those who say the economy is in good shape and those who feel that they are better off than their parents are more likely to have a favorable opinion of the third-term president. To the extent that popular views of Putin are shaped by democratic aspirations, people who place importance on a media free from censorship are less likely to have a positive opinion of Putin. Medvedev, the second half of what some have referred to as Russia’s leadership tandem, is also widely popular. Two-thirds of Russians have a favorable view of Medvedev, while only 28% voice an unfavorable opinion. Like Putin, Medvedev is broadly popular across demographic groups, while his ratings jump to 88% among Russians who either have a favorable view of Vladimir Putin or support Putin’s political party, United Russia. 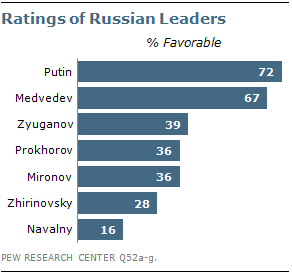 By contrast, among those with an unfavorable view of Putin only 12% support Medvedev. When it comes to how much confidence the Russian people have in Medvedev’s handling of world affairs, 59% say they have a lot or some confidence in his ability to do the right thing, while a third express not too much or no confidence. This is a decline from 2011 when 70% of Russians said they had confidence in Medvedev to handle world affairs and an even larger drop from 2009, when 76% of Russians expressed confidence in him. The public’s confidence in Medvedev is slightly less than that for Putin: 69% have confidence in Putin’s handling of world affairs, while about a quarter (24%) do not. While Putin and Medvedev enjoy high ratings, other political figures in Russia are not nearly as popular. Gennady Zyuganov, First Secretary of the Communist Party of Russia and runner-up in the March 4th presidential vote, is viewed favorably by 39% of Russians, while roughly half (52%) have an unfavorable opinion of him. Communist party sympathizers give Zyuganov his highest marks, with about eight-in-ten (79%) expressing a positive view. Those ages 50 and older (47%) and those with secondary or less education (46%) also tend to view Zyuganov more favorably, while those under 30 or with a college education tend to view him less favorably (34% and 36% favorable, respectively). The Communist party leader’s ratings are mixed among those who make 10,000 rubles or less per month (49% favorable/45% unfavorable). Meanwhile Russians making more than 25,000 rubles per month are about twice as likely to have a negative as positive opinion of Zyuganov (62% vs. 29%). The third and fifth place finishers in the March 4th presidential election, Mikhail Prokhorov, an independent billionaire, and Sergey Mironov, the candidate of the left-wing A Just Russia party, have limited appeal among the public. Just 36% of Russians have a favorable view of either Prokhorov or Mironov, with about half expressing an unfavorable opinion of each man. Prokhorov, who is also owner of an American professional basketball team, is more popular among urban and more educated Russians, but even among these groups he does not garner majority support. Vladimir Zhirinovsky, the leader of the right wing Liberal Democratic Party of Russia and fourth place finisher in the presidential election, is even more disliked among Russians. Only 28% of Russians express a favorable opinion of the outspoken politician, with nearly two-thirds (66%) saying they have an unfavorable opinion. Alexei Navalny, who was not a presidential candidate but was a driving force behind street demonstrations protesting the conduct of the December 2011 parliamentary and March 2012 presidential elections, is not well known among the Russian public. More than half (54%) have no opinion of the outspoken Putin critic. Only 16% have a favorable opinion of Navalny, while about three-in-ten (31%) view him negatively.